Have your favorite baking pans started to develop rusty spots? This happens to older, well used pans. Rather than throw it away you may want to try cleaning it. 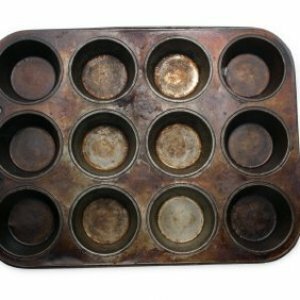 This is a guide about removing rust from baking pans. Remove rust from a tin pie pans using a raw slice of potato. Dip the potato in a some scouring powder and scrub away. 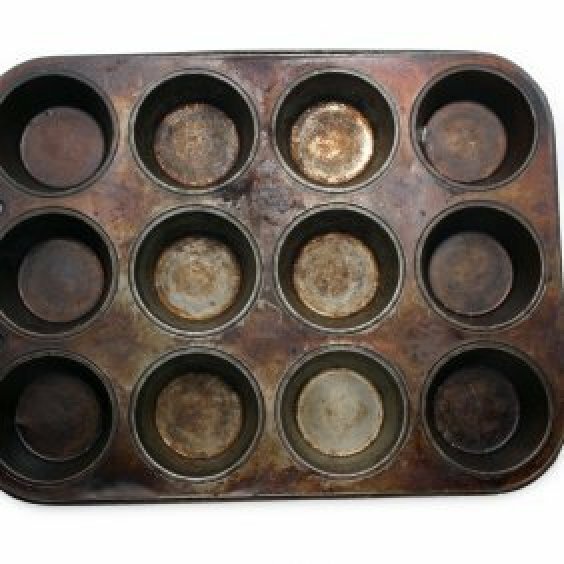 I had some muffin pans that had rust in them and I cleaned them really good with an SOS pad. Then I washed thoroughly and dried them. From then on I made sure that they were dry before putting them away. My mom has passed on two very old but very useful loose bottom cake tins to me. Unfortunately, as they are over forty years old and haven't been used for many years they are very rusty. I would appreciate a thrifty household remedy for removing this rust. Thanks for a wonderful site. I confess I'm not familiar with shopping in South Africa, but in the United States we have a product called naval jelly. You brush the "jelly" on the rust and it removes the rust very cleanly. Of course, you would then have to make sure that the pan is washed in hot soapy water. It has been my experience that once a pan has rust on it, it is very likely to come back. I realize these were given to you by your mother and they may hold sentimental value. If you choose to buy other cake pans, perhaps you could do something "craft-wise" with your mom's pans and hang them in your kitchen. I have cooking tools from my grandmother (and I'm 64 years old - today! so many of them would be over 100 years old) that I have hanging in my kitchen. They're too old to use, but I'd like to keep them for sentimental reasons. I was given many bread pans that had tough grime and rust and I scrubbed them with a Brillo/SOS pad, removed the rust and grime. From now on, when I wash them, I immediately wipe them dry and put them away to prevent more rust from re-appearing. How can I remove rust from metal baking pans? There's a product called ZUD. I don't remember who makes it anymore. It's in a green and yellow can just a bit smaller than a Comet can. It's in the same isle as Comet and such. It works wonders! Try that, if that doesn't work, try soaking your pans in a small solution of crystal automatic dishwashing detergent. It only takes but a small bit and only soak them for a half an hour. That should do the trick. Let me know if you have any luck. Try a Bar Keepers Best Friend powder and scrub. It is sold near the Ajax and Comet. It works great on burnt on OLD grease and burn marks from a BBQ pit grill. Soak it in Coke. It sounds gross, but Coca-Cola is great for removing rust. Rinse the pans in water, don't dry them. Instead sprinkle some baking soda on the rusty areas. Allow to sit approximately 30 minutes, then scrub. Depending on the size of the rusty area, you might have to do this twice.